The “press representative” enjoyed her new task to answer all these questions and she was impressed by the interest and the surprise on everyone’s face when they heard the story. This didn’t last more than 3 days…I already knew that her enthusiasm would end eventually. It is nice when people want to hear your story, when they smile and want to learn more. 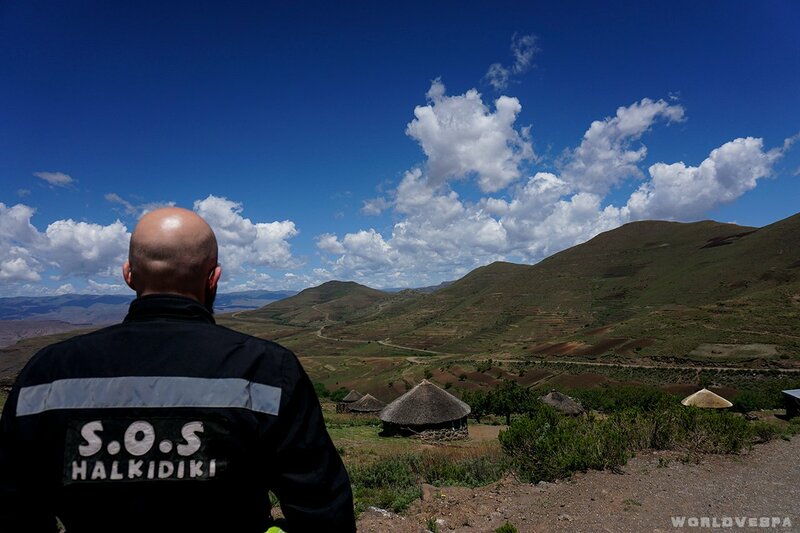 It’s nice to share what you have experienced, what you have seen with people you don’t know but depending on the circumstances, it can be a bit tiring…Sometimes you just can’t talk to anyone even if you want to: when you are really boiling in the motorcycle clothes and boots, when you are close to a sunstroke having driven for too many kilometers under the African sun, when you can’t move your legs after sitting for too many hours, when you are starving to death trying to find something to eat, when you feel like a shock absorber and all the vibration of the engine is in your hands…Are you convinced now that sometimes it can be difficult?! 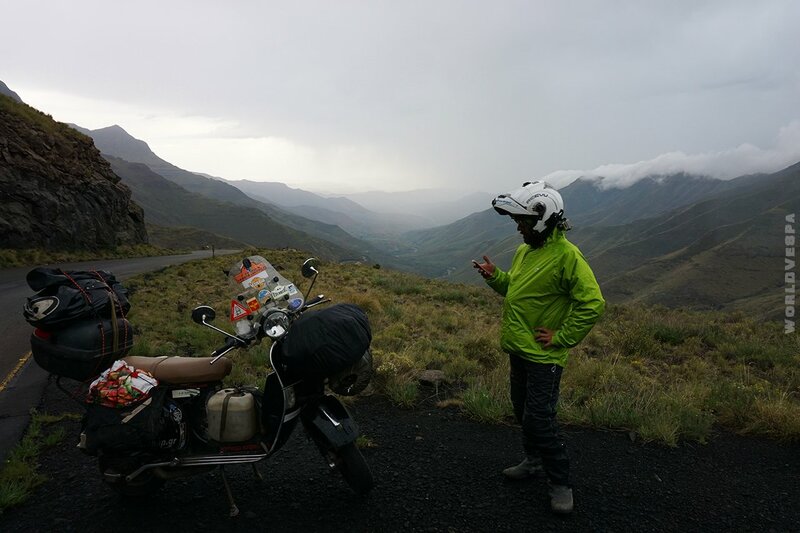 Crossing the borders of Lesotho was really easy. We didn’t need to have a visa or buy an insurance. 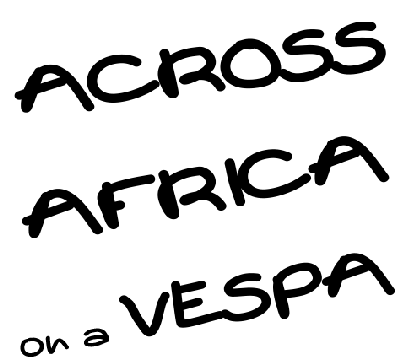 We just got a stamp on our passports with the date of entrance and paid 30ZAR (2 euros) for the vespa. 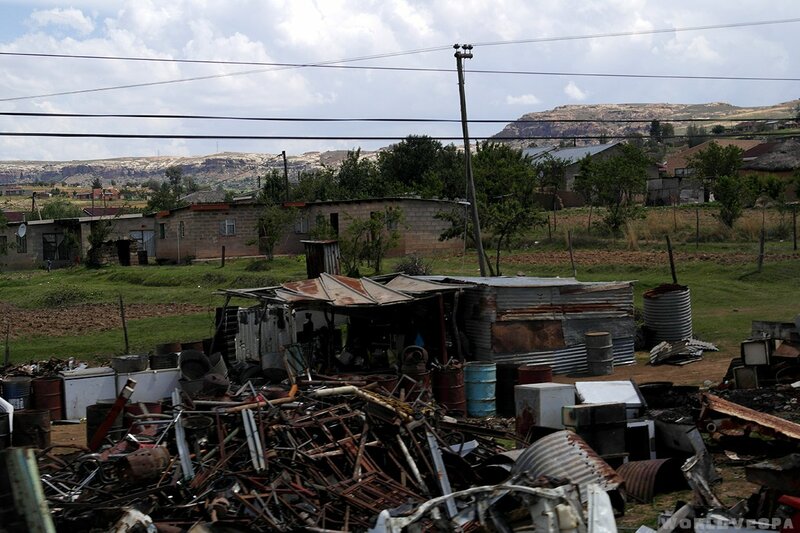 The first thing we noticed when we entered this small country was that there were no fences at all! 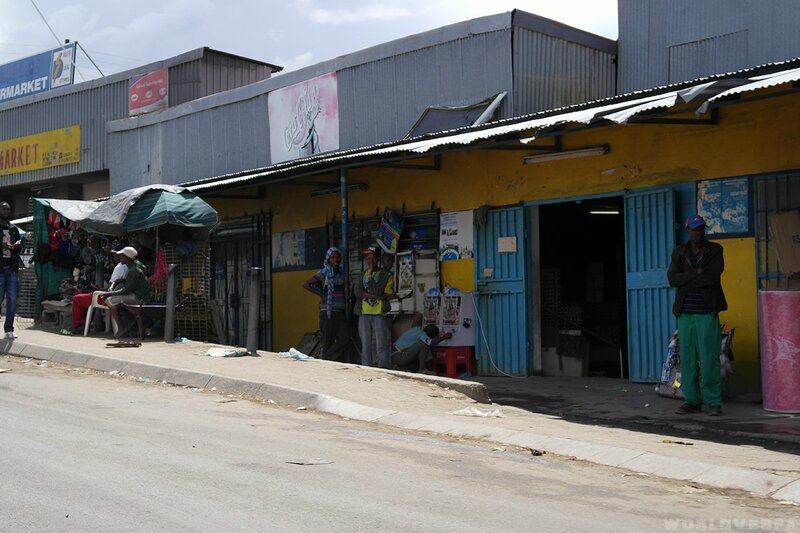 The fences I hated in Namibia and in South Africa had disappeared! 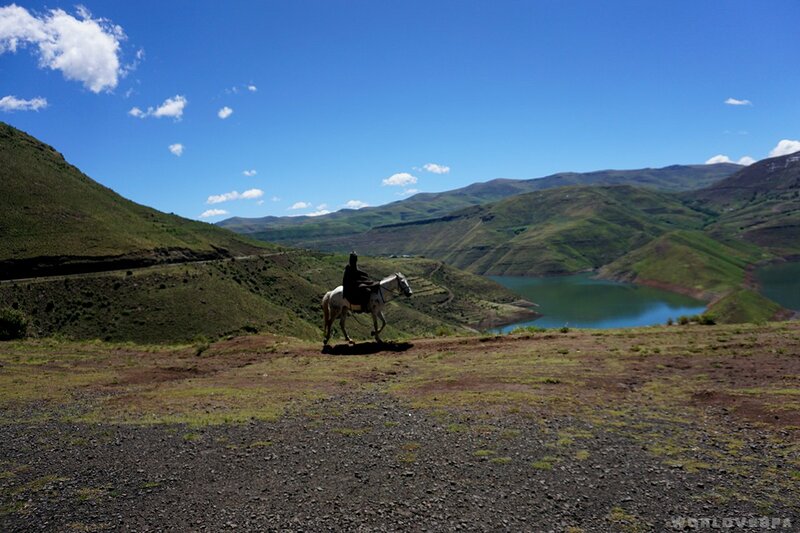 Lesotho, a country with no fences! What are you looking at? There’s no WiFi here! / Τι κοιτάς το κινητό αγόρι μου; Δεν έχει wifi εδώ πάνω! We instantly felt that we were in Africa again! 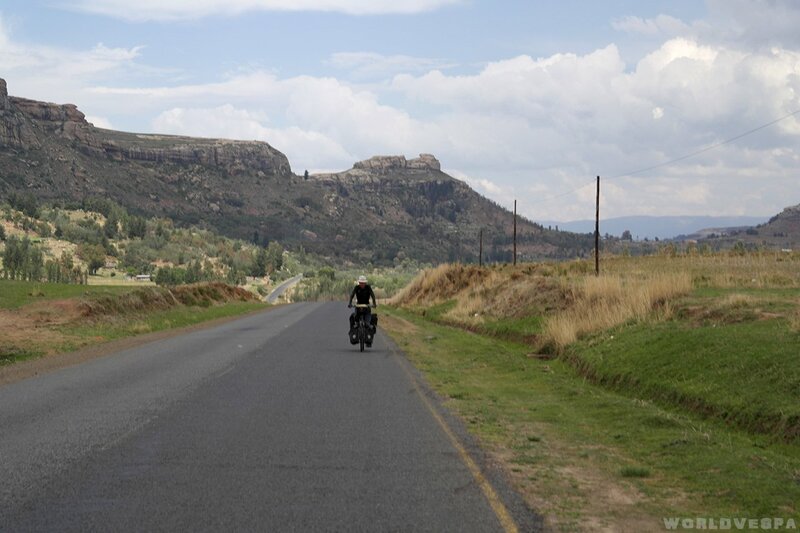 We didn’t visit the capital city, Maseru or any other big city (the 2nd biggest city in Lesotho has a population of 75,000) and the first impression I got from Lesotho was that it was 100% Africa (with a bit of Alps…). 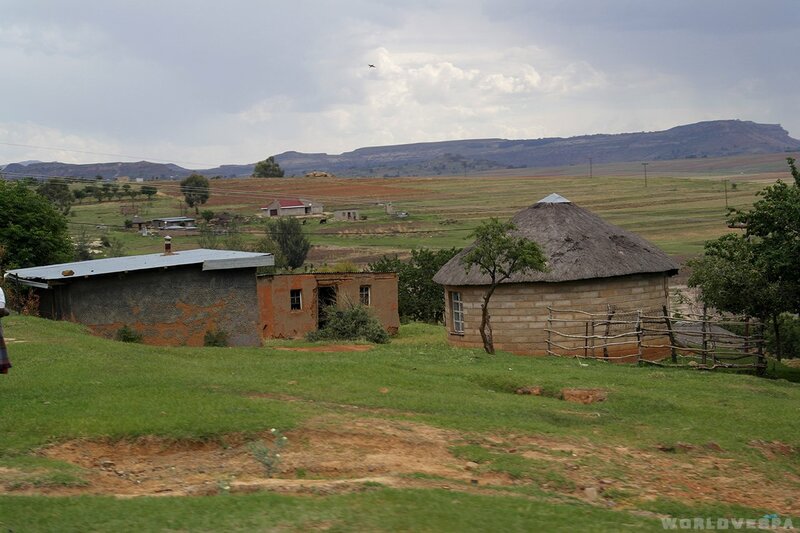 It is a poor country, but the difference between Lesotho and other poor African countries is that Lesotho is a very “tidy” one. 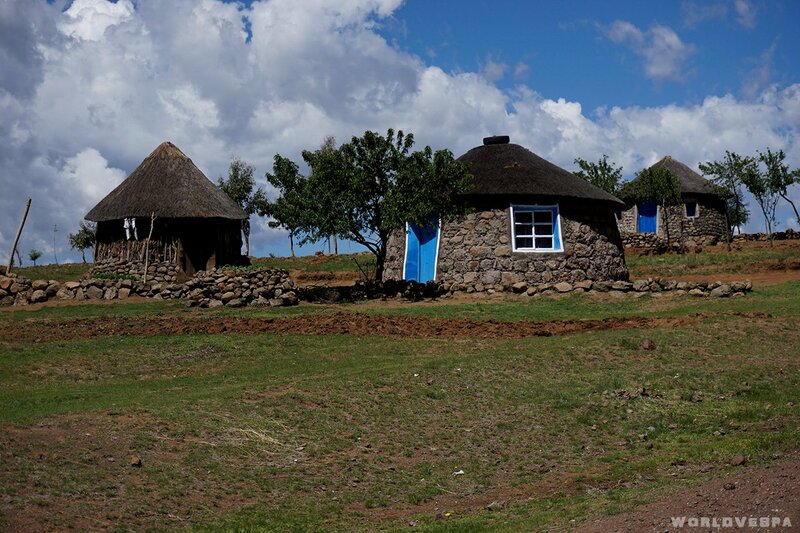 For example, the land is being cultivated even with primitive means of cultivation and it is not left deserted. There aren’t many cars and people use horses to go from one place to another, or they just walk. 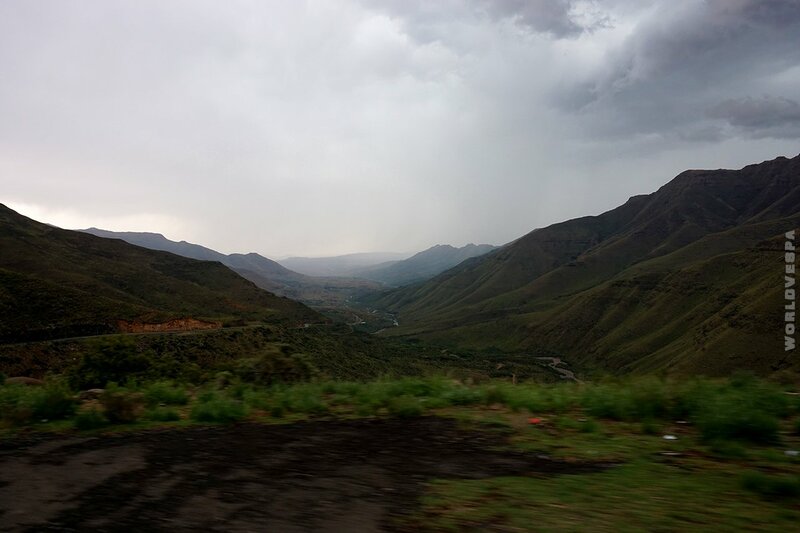 The kingdom of Lesotho is a small mountainous piece of land surrounded by the state of South Africa. 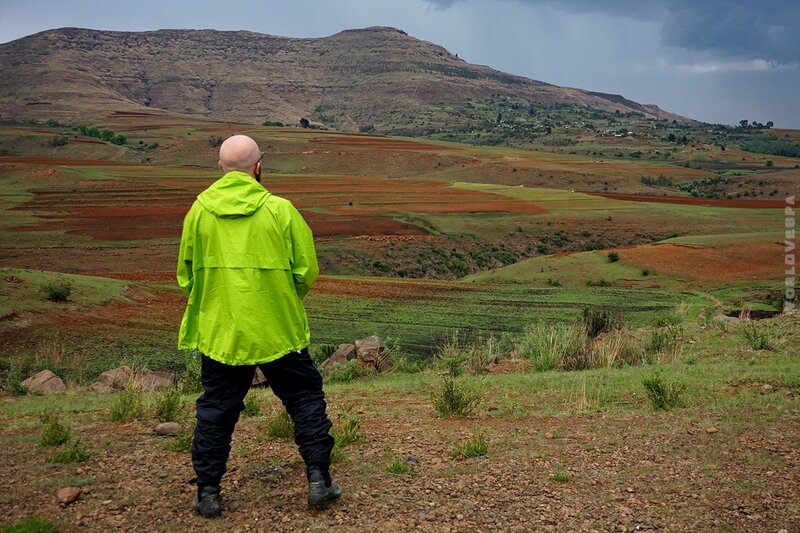 I knew nothing about Lesotho before I got there (I don’t know why I had missed that!) and I didn’t want to visit it only to say that I have been to one more country. 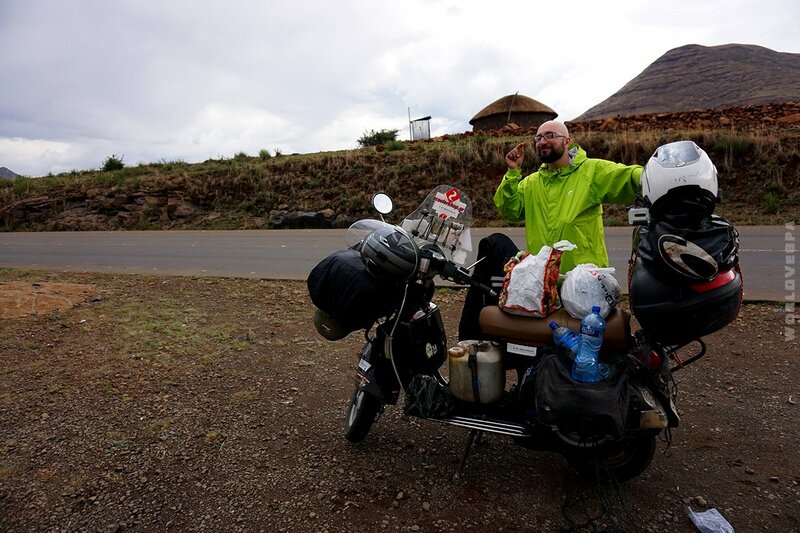 Tom, a guy who hosted me in South Africa insisted that I should go to Lesotho. 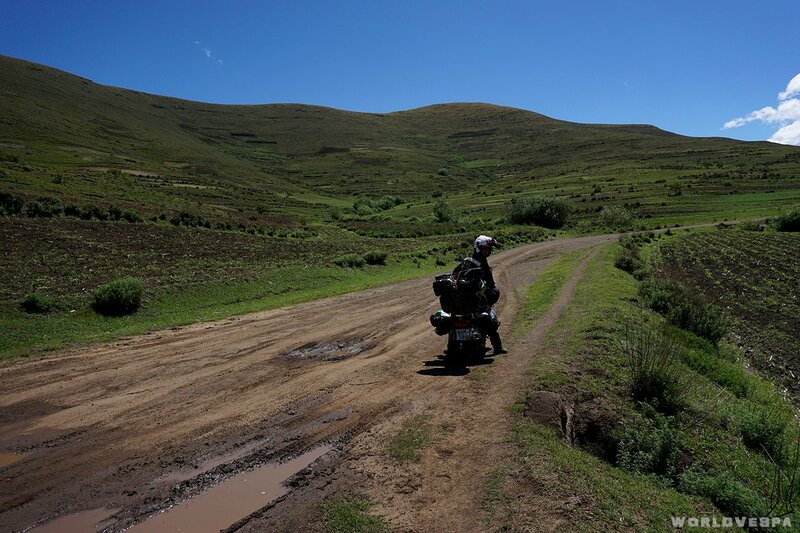 He told me stories about its mountains and about Sani Pass, a mountain pass that I had to cross in his opinion. So, he convinced me to make that sacrifice and go there (I would definitely sacrifice something – a shock absorber or a set of clutch disks…). From the first day, we saw what we would go through! 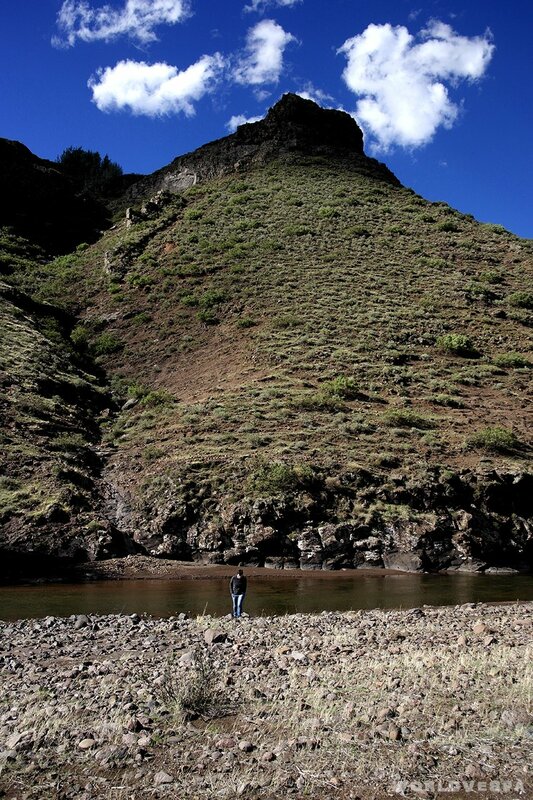 We started climbing on the mountains and the altitude was about to get really high. Luckily we were on a tar road but the vespa had different kind of problems: we were two now and we also had a heavy load with all our luggage on. 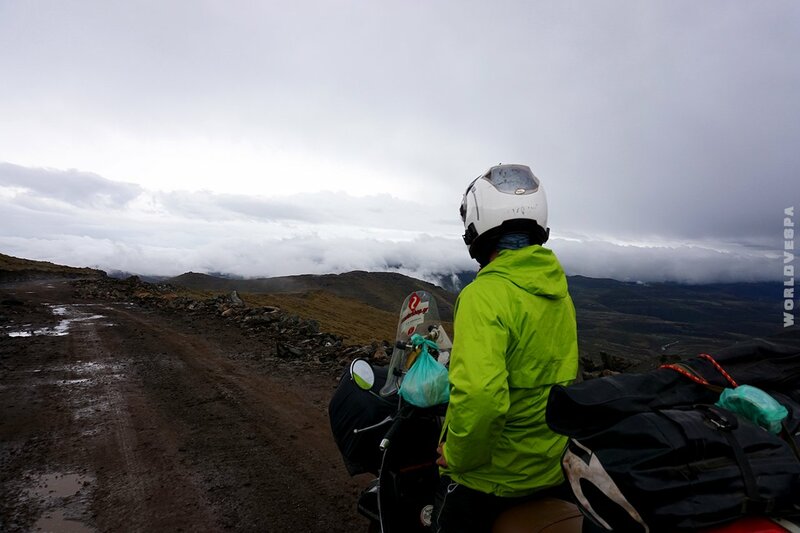 The third gear brought us until 1,500 meters of altitude, then with the second we made it to 2,000m. After that, we put the first gear and started praying! 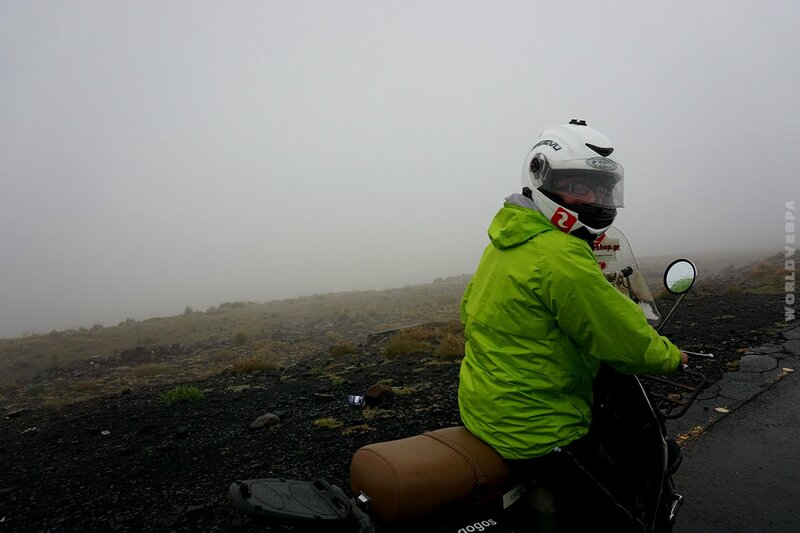 I was now close to God, maybe due to the difficulties or the altitude…we were really close to the clouds! 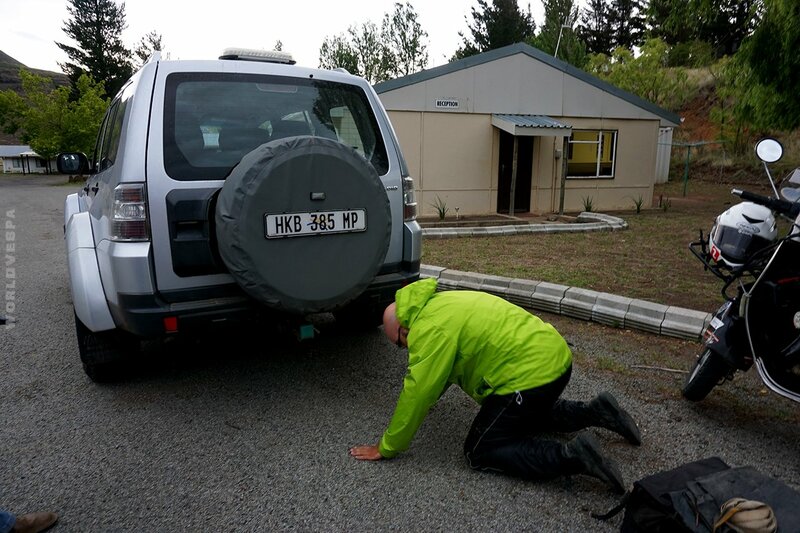 Unfortunately no God was listening at the moment and when we climbed to 2,700m the engine refused to continue. Probably because there was not enough air. We fought for some hundred meters to continue (Alexandra was walking and I was pushing the vespa) but our efforts were in vain. 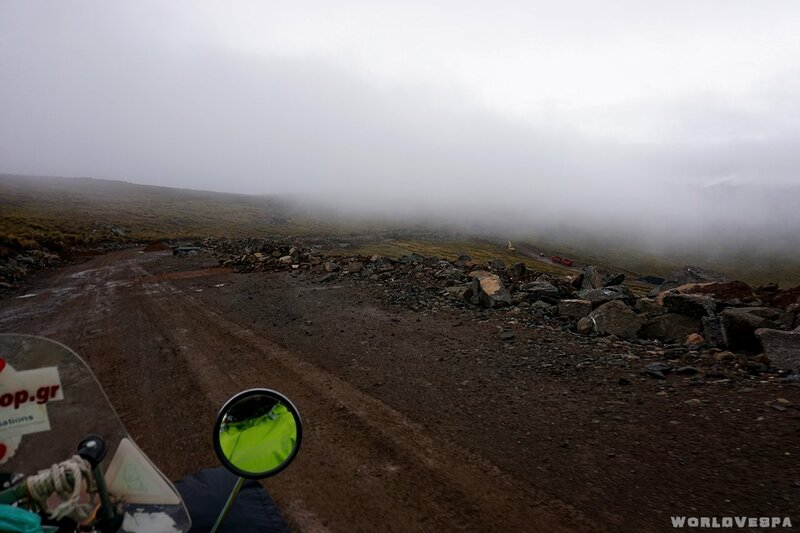 Our luck didn’t abandon us for long as we saw a 4X4 approaching! Without too much thought, we ran towards it and almost forced the car to stop. 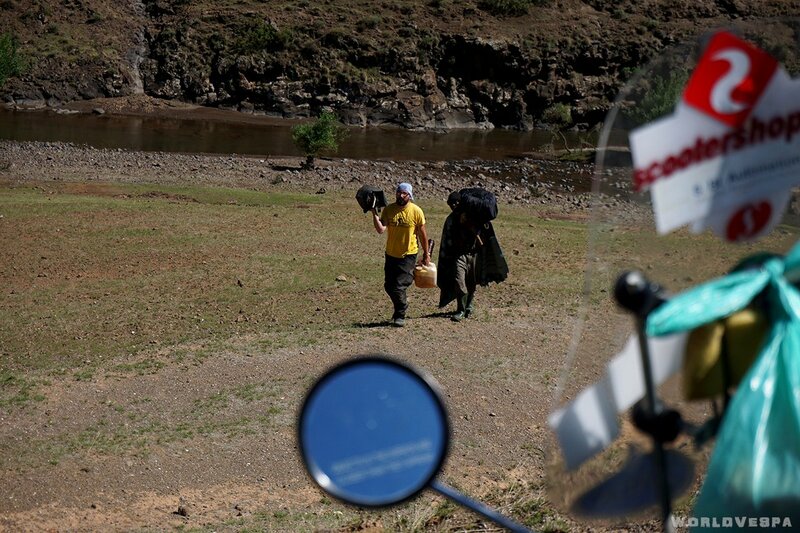 Inside it, there were 2 Boers from South Africa who were really surprised to see us and offered us their help. We put all our luggage in their big trunk, Alexandra took the back seat and we went to the next village in 15kms distance. 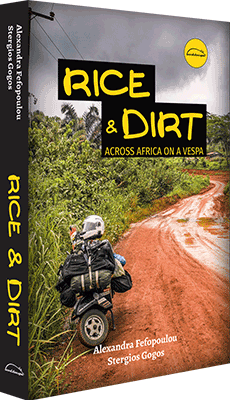 That was the quickest 15kms distance my vespa had ever covered on African soil! 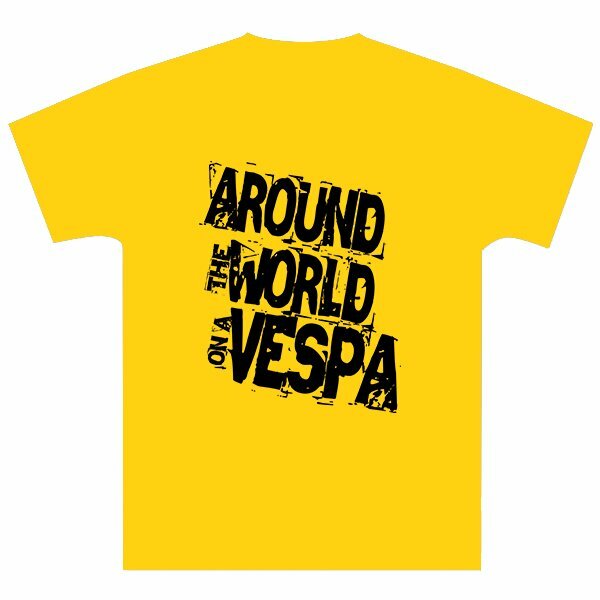 The poor vespa was very happy without that heavy load on its back! 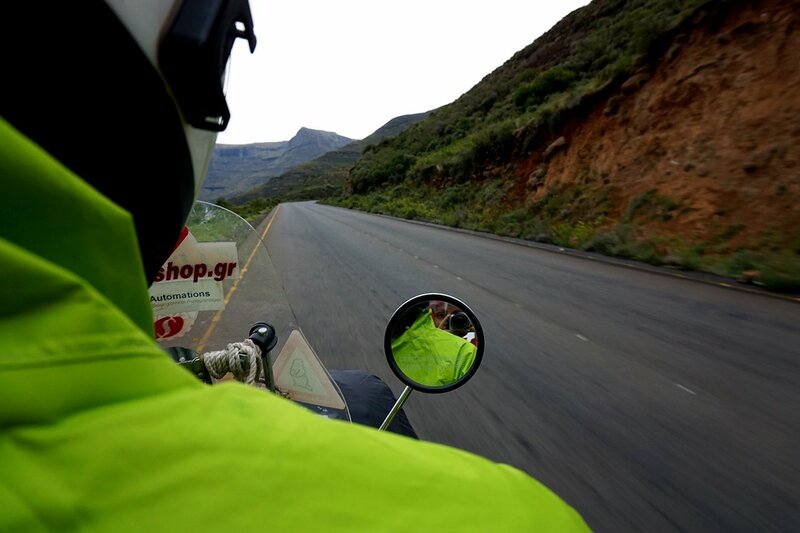 I also felt that I was riding a 1000ccs motorcycle! 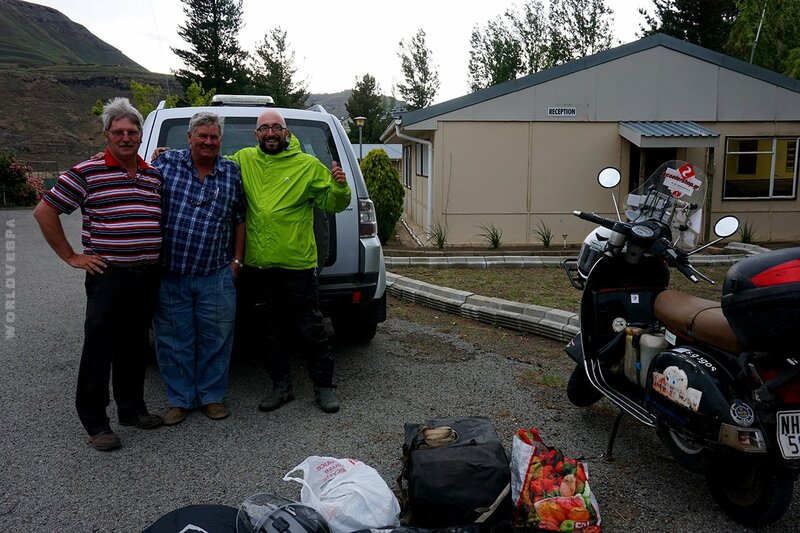 The 2 Boers knew the only place we could spend the night at the village they brought us. 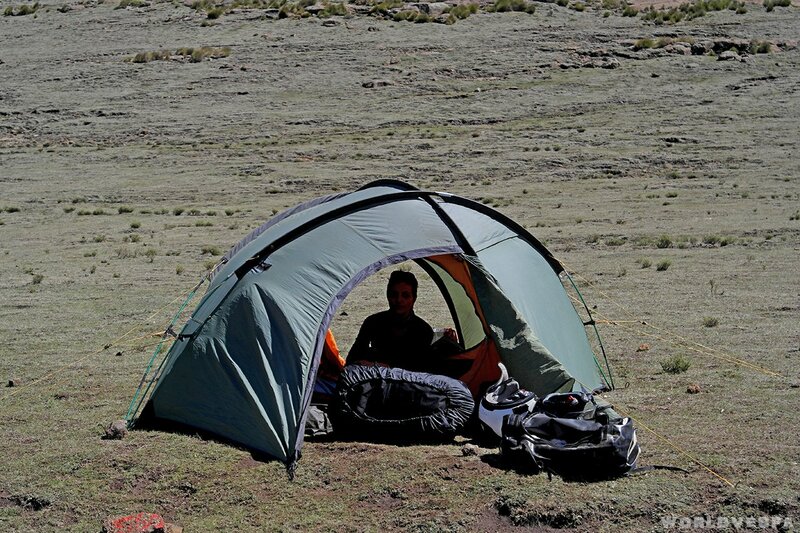 It was not exactly the type of accommodation we would choose but we didn’t have any choice. So, we spent the night at a…“chalet” – a ski resort which cost us 20 euros per person! 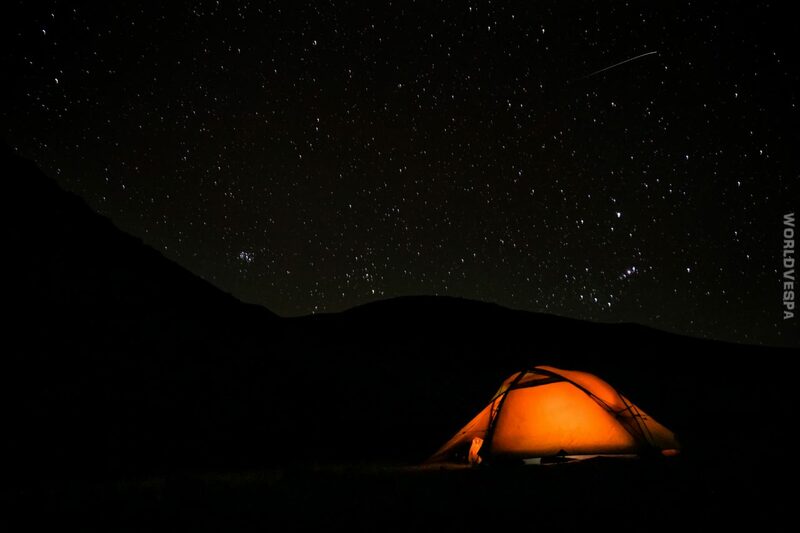 We enjoyed a comfortable sleep, we cooked a nice dinner and had the opportunity to dry our clothes. After all, we deserved it! 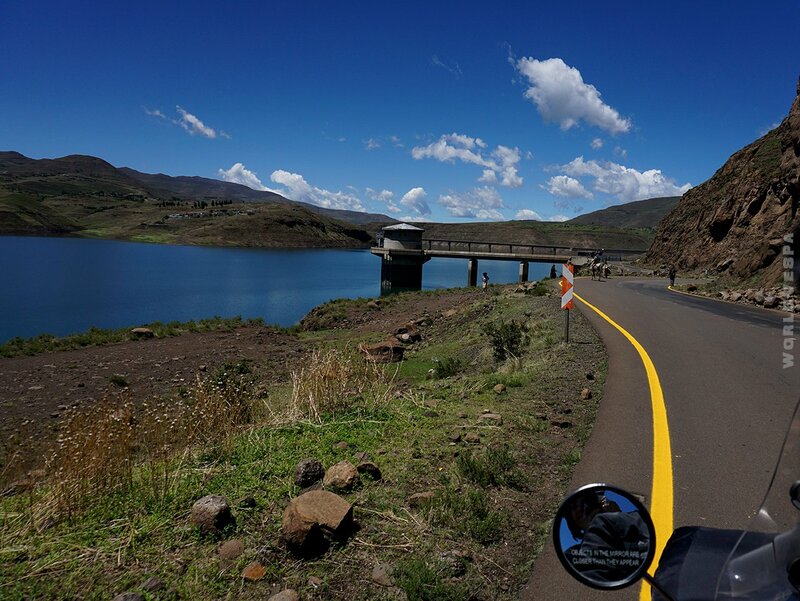 We were already at Katse Dam, the second highest and first in terms of altitude dam in Africa (1,993m altitude). I can’t describe the beauty of the place! 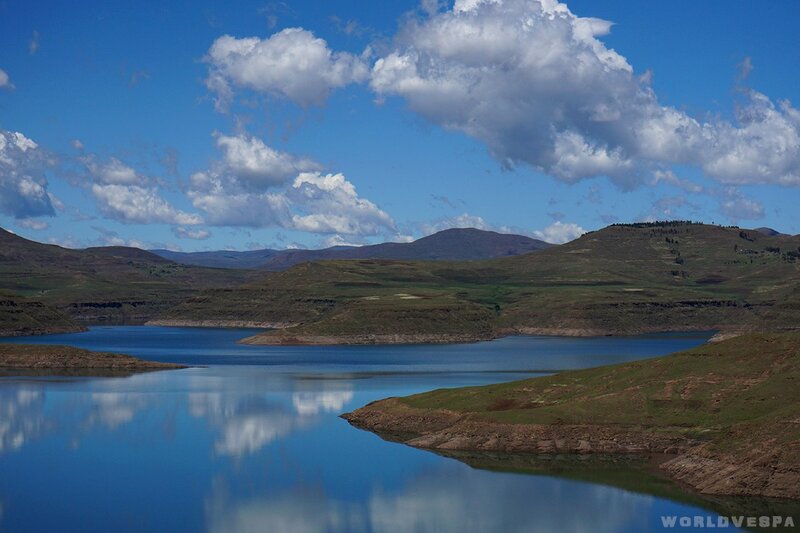 A huge artificial lake surrounded by high, green mountains! Gorgeous! 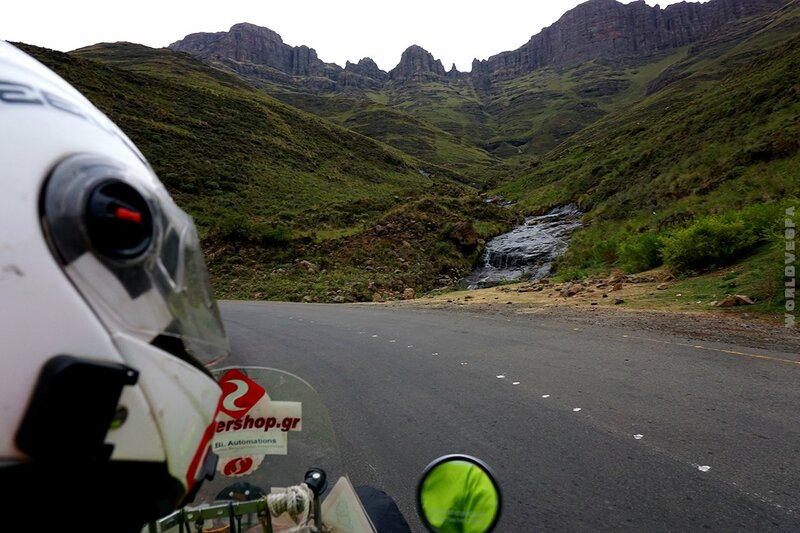 Our third day in Lesotho was the best one! 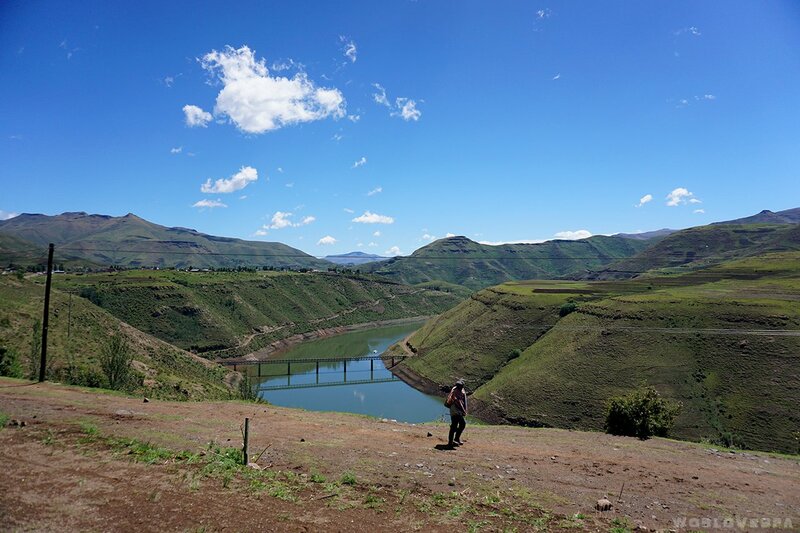 From Ha Lejone (the village where we spent the night) we crossed Katse Dam and we got to Thaba Tseka (a small town) and then to the most beautiful part of our route. The nature was absolutely at its best and it is impossible to find any words to describe the beauty of the landscape…the only thing that we managed to say was “Wow!” or “Oh, wow!”. Our eyes were wide open to see as much as we could and our jaws dropped! That day ended in the best possible way. 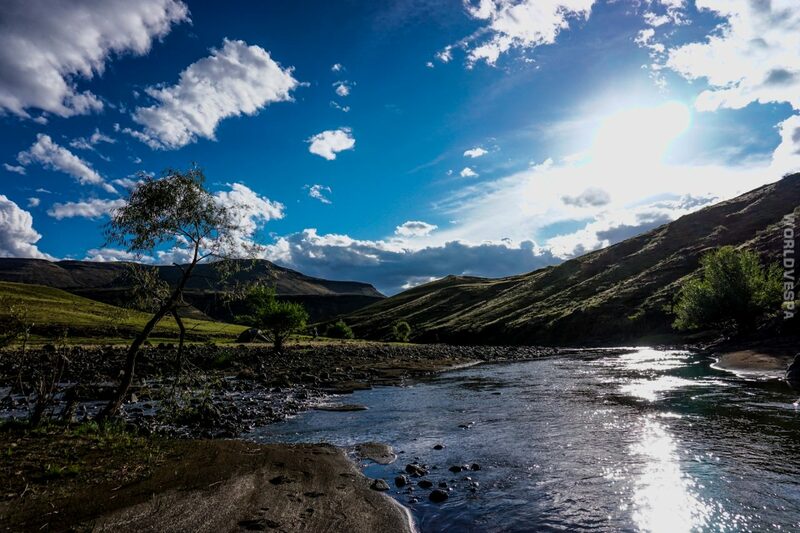 We found a place to pitch our tent and spend the night and probably it was one of the most beautiful places (if not the most beautiful) I have ever seen in my life: in a remote area, next to a small river and surrounded by the high mountains. Perfect! Looks ok to me! / Μια χαρά μου φαίνεται! The next morning we got up early due to the heat and we realized we had a difficult task: the place we had spent the night was not too far from the road but we had to carry our stuff because it was impossible for the vespa to climb with everything on it. While we were eating our breakfast (bread with olive oil, tomatoes, peppers and cucumber), we noticed someone watching us among the rocks. As usual, we had been discovered. While we were not looking towards the man who was watching us, he took the opportunity to approach (silently and discreetly, like a cat) and every time he thought we were not looking at him, he was approaching more and more. He was very discreet though (he thought). He didn’t want to make us feel uncomfortable, he was just watching. The only problem was that Alexandra couldn’t feel that comfortable to pee knowing that a total stranger was watching, but I didn’t have any problem to take a leak…he chose to see me, it wasn’t my fault! The man who had been watching us all morning, came to help us without asking anything in return! / Το κεφαλάκι που απ’ το πρωί μας παρακολουθούσε από απόσταση ασφαλείας, στη δύσκολη στιγμή, ήρθε και μας βοήθησε χωρίς να ζητήσει κανένα αντάλλαγμα! The road ahead of us was under construction by a Chinese company (those who will take this road in some months will drive on tar…you lucky bas***rds!) 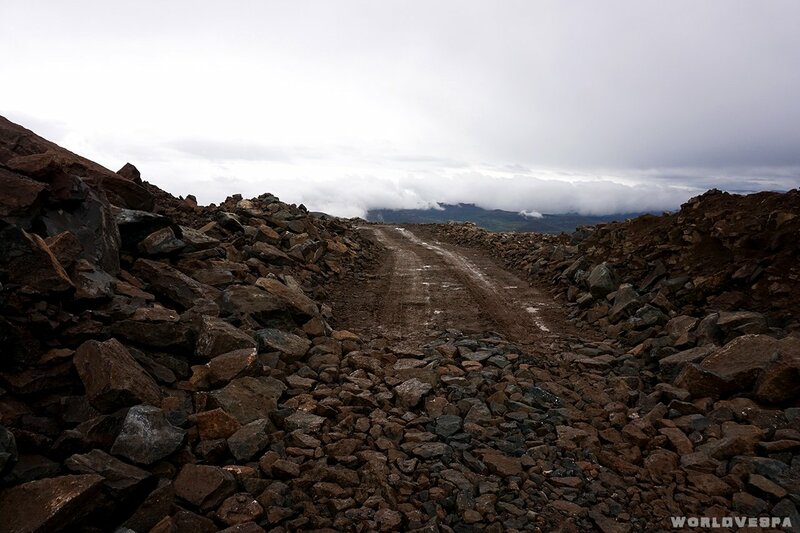 and even if there weren’t any rocks, the rain made our lives difficult because of the huge amounts of water and mud. The mud was not very deep but enough to cause a fall (we were driving in very low speed). For me it was just another stupid fall but it was the first fall for Alexandra who injured (not seriously) her ankle. 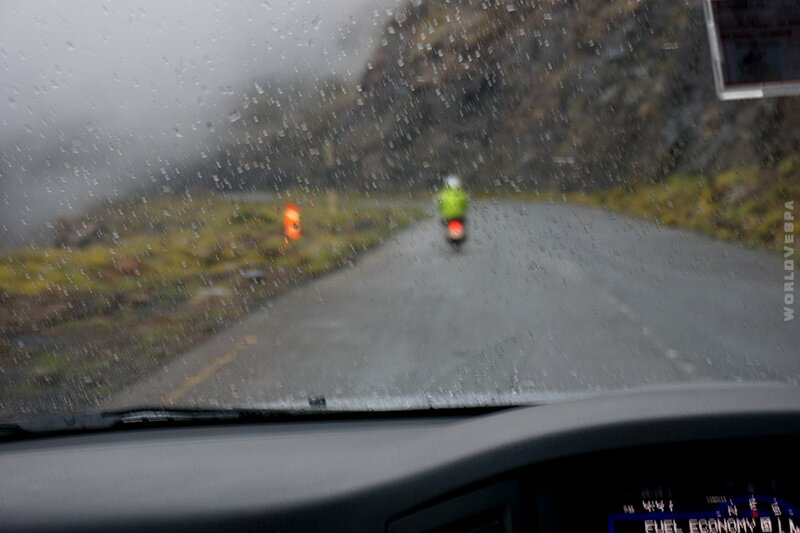 She was a bit shocked and as the rain was continuous and the wind was now cold, the scenery had become a bit hostile. 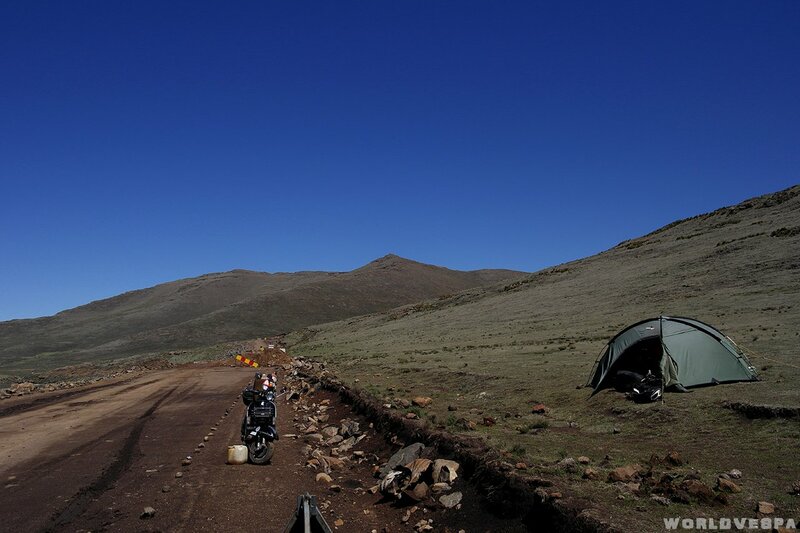 We decided not to keep on trying to find a nice place to pitch our tent for the night, but to stay where we were and pitch the tent next to the road where we had fallen. For me, it was from the beginning one unique experience with the heavy rainfall and the cold wind blowing, but for Alexandra, at that time, it wasn’t so pleasant. She didn’t manage to sleep well because of the cold and the pain of her ankle. Of course now when I remind her of that day, she just can’t stop smiling, so I suppose that it was a unique experience for her, too!